Last week, William James "Bill" Murray was awarded the Mark Twain Prize for American Humor in a ceremony airing tonight on PBS. 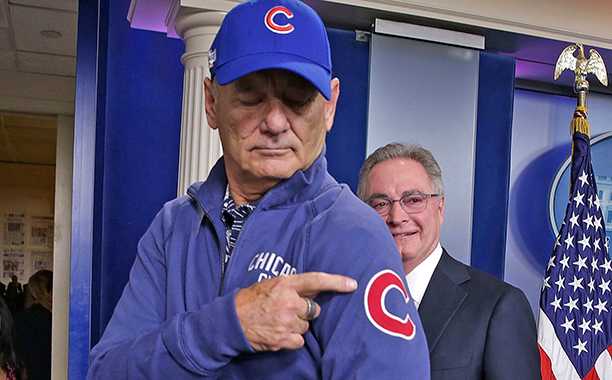 But there will be at least one fan not tuning in to watch tonight: Bill Murray himself. Bill Murray, a lifelong Chicago Cubs fan, will instead hit the Wrigley Field press box to lead the stadium in a rousing rendition of “Take Me Out to the Ballgame” during the seventh inning stretch at Game 3 of the Cubs’ battle against the Cleveland Indians in the World Championship 2016. The best-of-seven series is currently tied at one game apiece for both the Cubs and the Indians. Friday’s match-up marks the first World Series game to be played at Wrigley Field since 1945. Fall Out Boy’s Patrick Stump, a Chicago native, is set to sing the national anthem, while six-time MLB All-Star Bill Murray will throw out the ceremonial first pitch. No Comment to " William James "Bill Murray" to sing 'Take Me Out to the Ballgame' at World Series Game 3 "